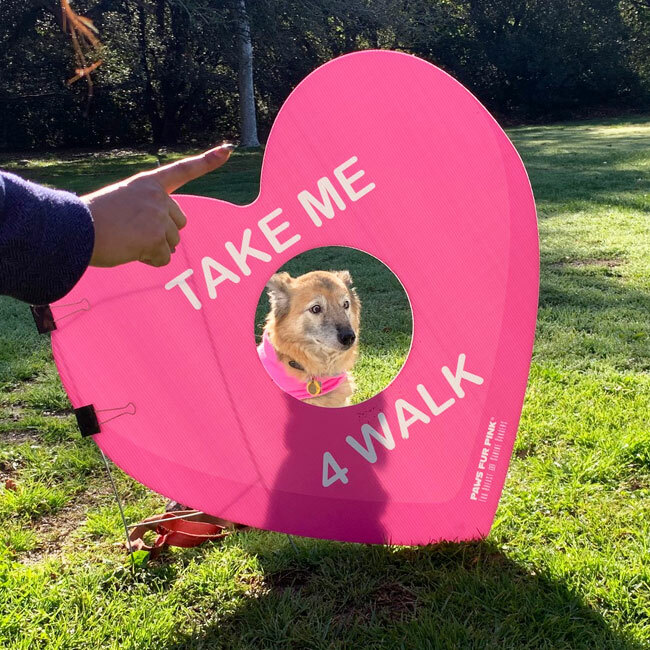 Our South Bay hospital teamed up to do the Paws Fur Pink walk in February. 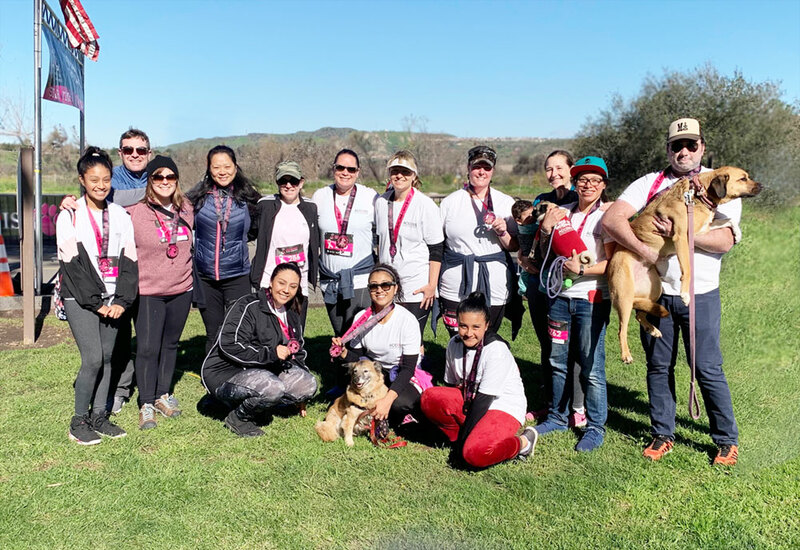 This wonderful charity helps fund breast cancer and canine cancer research, and our team was all smiles knowing they were helping the greater good! Please follow this link for a memorial honoring Sydney. 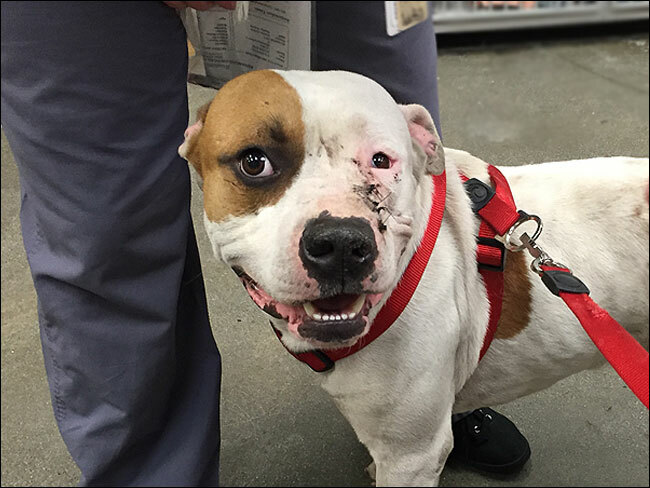 Dog Survives being shot in the face…. PJ, a lovable two-year-old Pit Bull, was at home in his yard when his owners heard a loud pop at 4:30am, then heard PJ run into the side of their house. 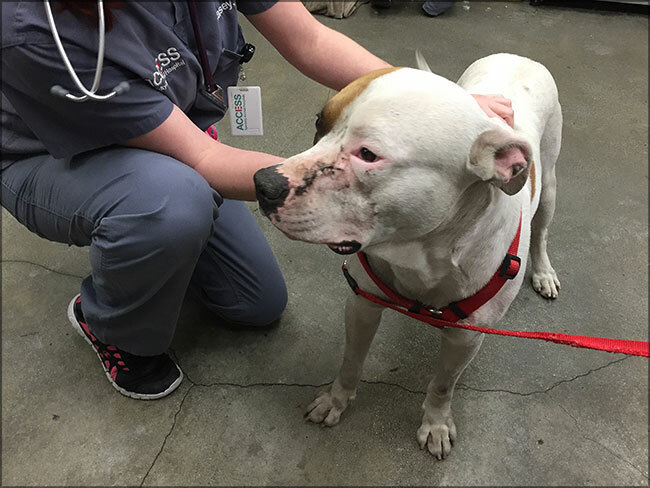 His owners immediately rushed to check on him and were horrified to find that he had a large wound on his muzzle—PJ had been shot in the face. 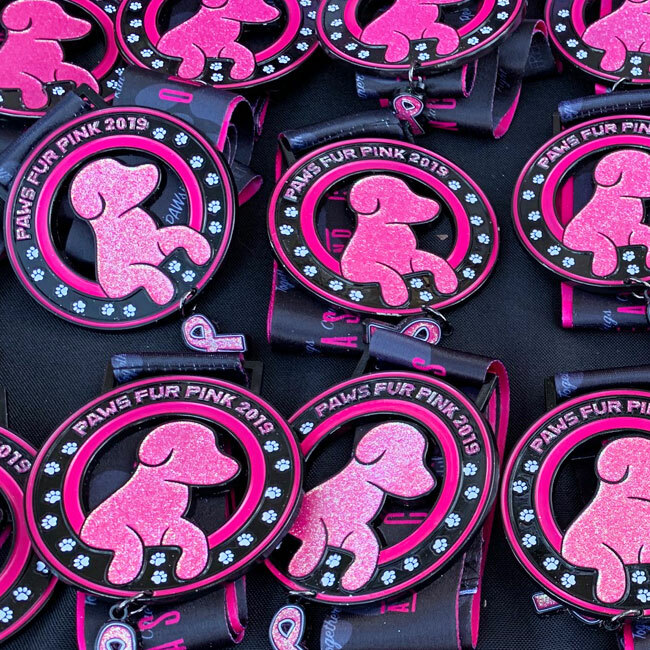 PJ and his family rushed to the ACCESS LA emergency room and met with Dr. Nicole Skilling, who administered fluids and pain medication with his owner’s approval. 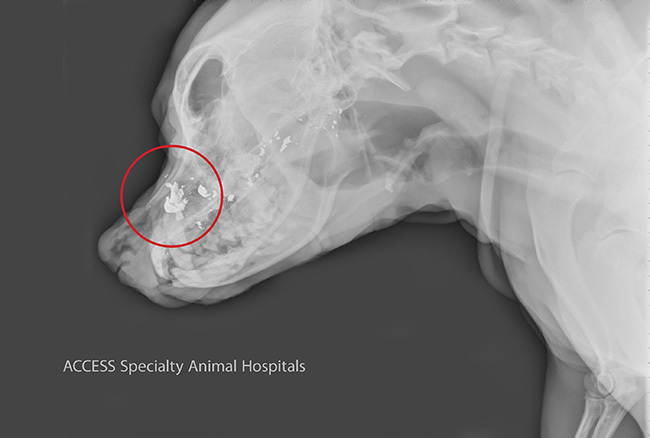 Radiographs confirmed everyone’s suspicions— a fragmented bullet (see below) was in PJ’s face. 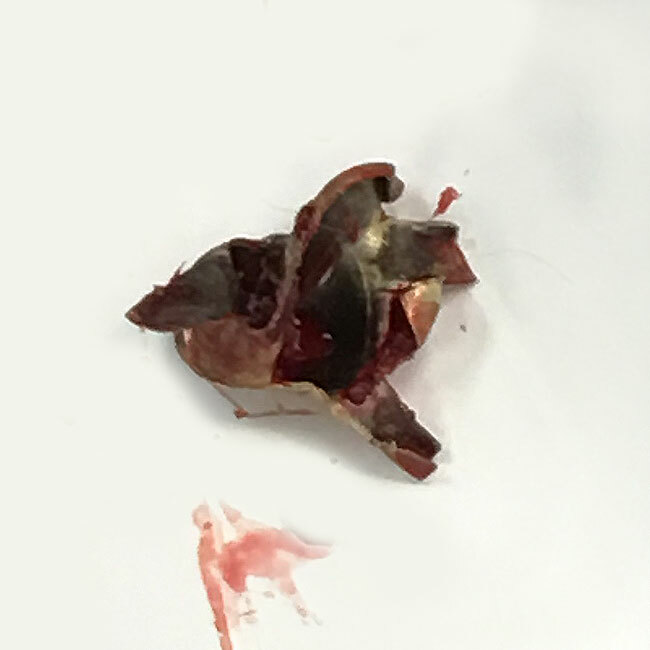 Dr. Skilling was able to clean the wound and remove the fragments and even checked PJ’s eye and throat to make sure there were no further injuries. Luckily, other than a bullet in his snout, PJ was healthy. After the procedure, Dr. Skilling closed the wound with stitches and PJ was sent home with antibiotics, pain medication, and a snazzy new cone to keep him safe and healthy. We were overjoyed to see PJ back a few days later for his recheck. He greeted everyone in the lobby and gladly accepted pets and snuggles from our staff while he was in our treatment area! His stitches were examined and found to be healing well and as for his eyes—they’re perfect! PJ will return to the hospital in a few days to have his stitches removed once he is fully healed and is thankful for the quick actions of his owners. Unfortunately, no one knows who did this to PJ or why, but the authorities have been notified and are investigating the case. 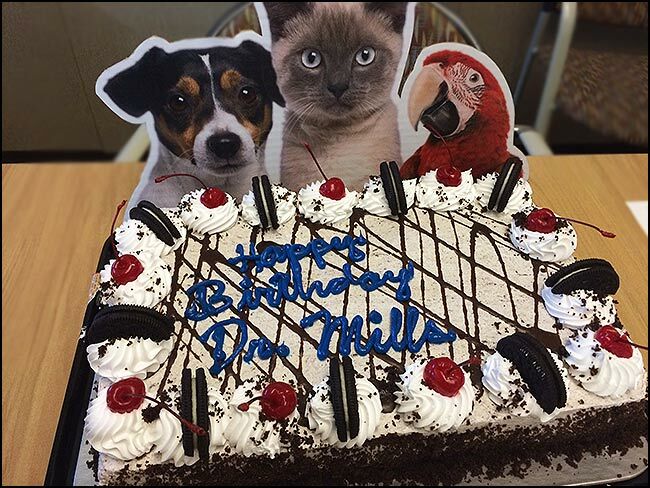 This week we celebrated our owner, Dr. Rich Mills’ birthday! We are lucky to work in a place where we’re able to help animals and make meaningful connections; and that is all because of Dr. Mills. We’re thankful for him every day and we’re excited to celebrate his big day with him! What could one of our criticalists, Dr. Joyce Lee, be doing? 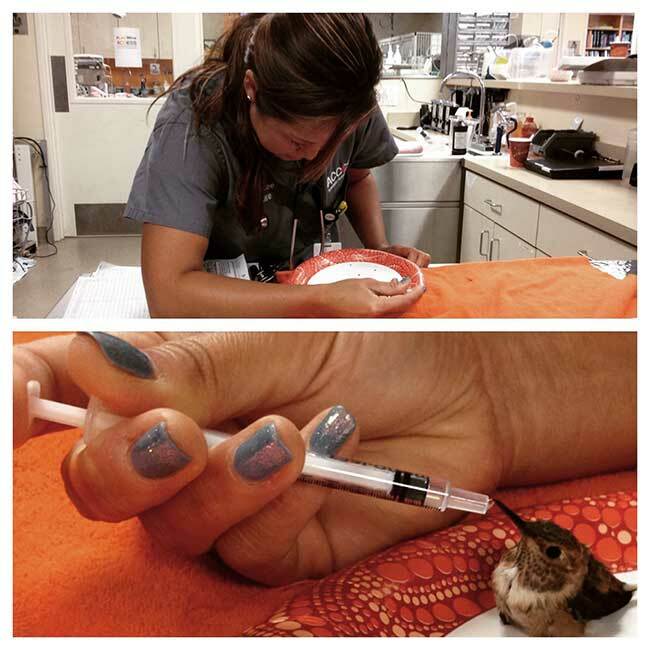 Caring for her smallest patient of the day– a hummingbird! 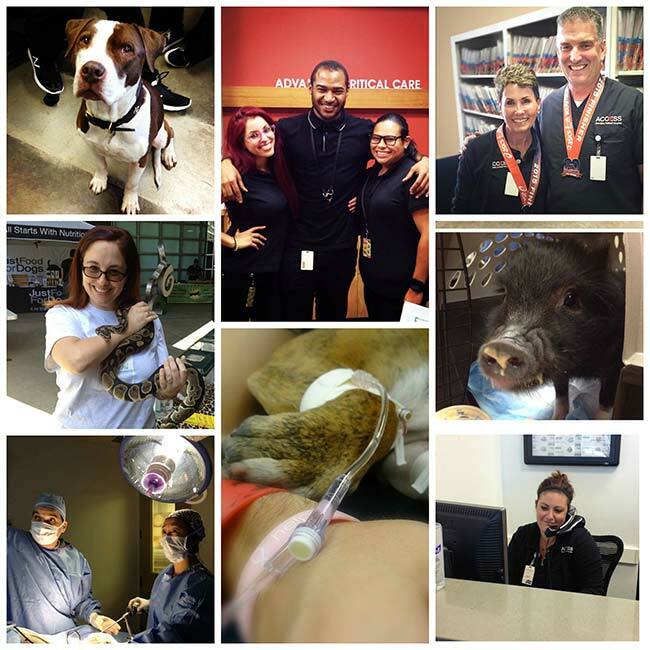 ACCESS Specialty Animal Hospital is looking for new team members to join our Client Care Department. The face of ACCESS; a CCR is responsible for the first and last interactions with our clients. They prepare paperwork for patient arrival, care for the client/patient during check in process, maintain patient records, and guide the client through the discharge/check out process including handling financial transactions. They are also responsible for maintaining our lobby space and exam rooms to serve our clients. Guide clients through their pet’s appointment, procedure, or hospitalization. Assist the doctor with patient/appointment in take; organize/track patient diagnostics; coordinate hospitalize patient treatment; prepare patient discharge reports/in-hospital updates; and communicate with clients, pDVMs, and pharmacies as needed regarding appointments, medical concerns, patient updates, referrals, and prescriptions. Responsible for directing calls to the appropriate person. Our phones are answered 24hrs a day by a live person. Responsibilities may include answering patient emergency calls, making appointments, taking messages, prescription refills, and handling general client inquiries. We look forward to applicants interested in any of the above roles. All interested applicants should show a commitment to Quality in all of that they do, conduct themselves with the utmost Integrity, have Compassion for animals and humans alike, and be able to provide the best Service possible for our clients and patients. These attributes ensure the candidate will be an efficient, effective, professional, and positive team member. Interested applicants should submit a cover letter and resume (careers@accessvetmed.com) detailing experience specifically as it would correlate to the position you are applying for. 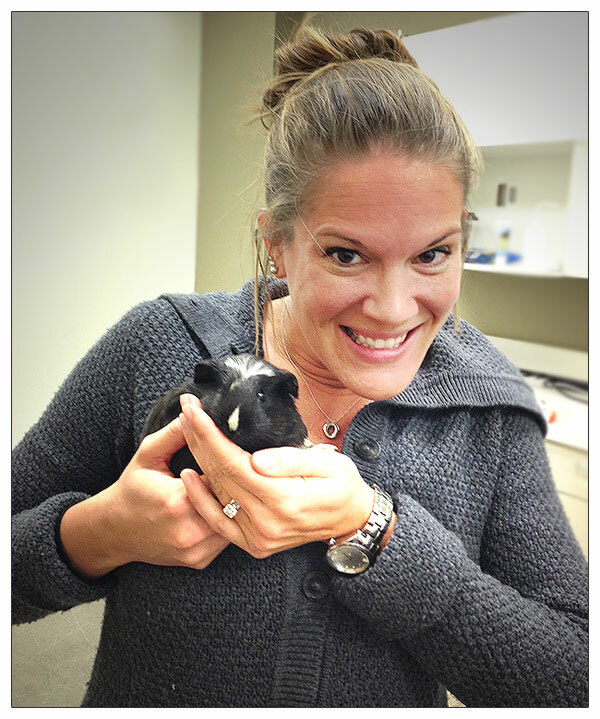 Olivia Petritz, DVM, DACZM, joined ACCESS Specialty Animal Hospital, Los Angeles, in the fall of 2013 to head up our new Avian and Exotics department. Although her future was fairly clear cut, Dr. Olivia Petritz has had a few very exciting moments along the way. We sat down with Olivia to find out what led her to veterinary medicine and learn more about her. How did Dr. Petritz decide she wanted to work with animals? She has always loved animals and science. Since childhood, Olivia was certain she wanted to be a paleontologist. “I wrote letters to Paleontologists all over the world from the time I was five to about eighth grade. I have big manila envelopes full of letters from about 40 countries.” Once in high school, Olivia went to visit paleontologists in several museums and realized she wanted to work with living animals. Despite her change in occupation, the Brontosaurus still has a place in her heart. What is her favorite animal? Dr. Petritz’s first job was at the Columbian Park Zoo in Lafayette, Indiana, which housed several species of big cats, primates, birds, lizards, and more. At 18 years old, Olivia Petritz was simply cleaning cages and assisting staff to make sure the animals were happy and properly cared for; but she fell in love with the idea of being an exotics/zoo veterinarian and having the knowledge to treat all species. This job inspired her to become the avian and exotics specialist she is today! What is the coolest procedure Dr. Petritz has ever done? What is her favorite procedure to do? Abscess surgery on any species. Dr. Petritz likes being able to fix, clean, and help heal patients with these infections. Does Dr. Petritz collect anything? Where is her favorite place to visit? Dr. Petritz went to South Africa as a veterinary student. There, she helped dart and anesthetize rhinos, wildebeest and giraffe, and learned about conservation medicine. She fell in love with the country and was even able to extend her trip to see more of the area. What about the Norman Rockwell painting? Dr. Petritz’s father has been a Normal Rockwell historian for over 30 years, and has interviewed numerous people who modeled for the famous artist. Through her father’s hobby, she was able to meet the man who was the subject of Rockwell’s 1961 “The Veterinarian.” She even has a signed copy framed and hanging in her office. What does she consider to be her greatest achievement? “Becoming boarded in zoo and exotic medicine.” Dr. Petritz happens to be the first American and the second person in the world to become a board-certified veterinarian under the sub-specialty ZCA (Zoologic Companion Animal) in the American College of Zoological Medicine (ACZM). 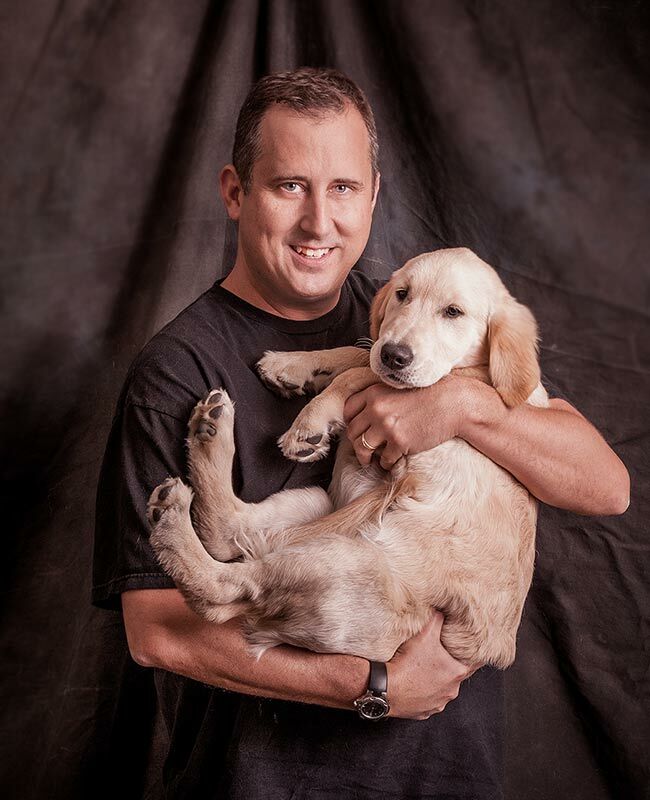 What is one thing Dr. Petritz would like to tell pet owners? Become knowledgeable about your pet before purchasing or adopting. It is so important to know about their diet, husbandry, life expectancy, and more before bringing your new family member home! Dr. Olivia Petritz is one of over a dozen skilled and interesting doctors at ACCESS Specialty Animal Hospitals, but one of less than 200 to be board-certified in her specialty worldwide. 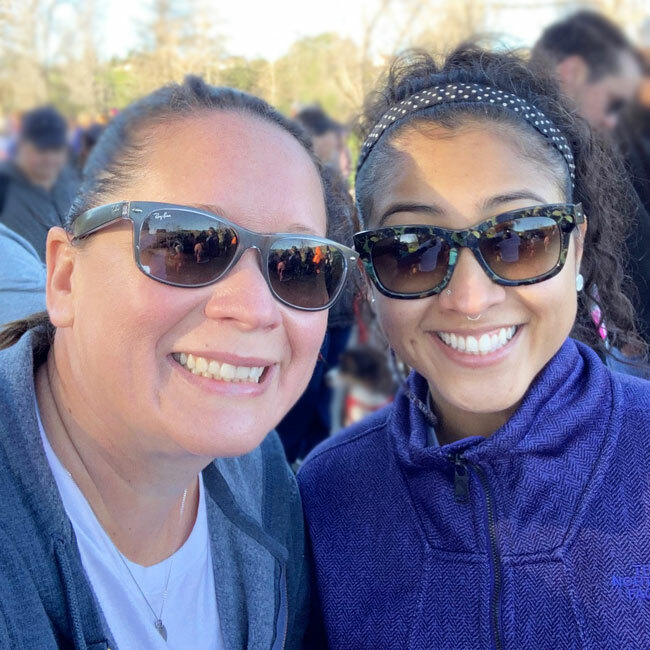 She brings cheery optimism, fierce knowledge, and passionate dedication to each patient she works with, and we are thrilled to call her part of our team. 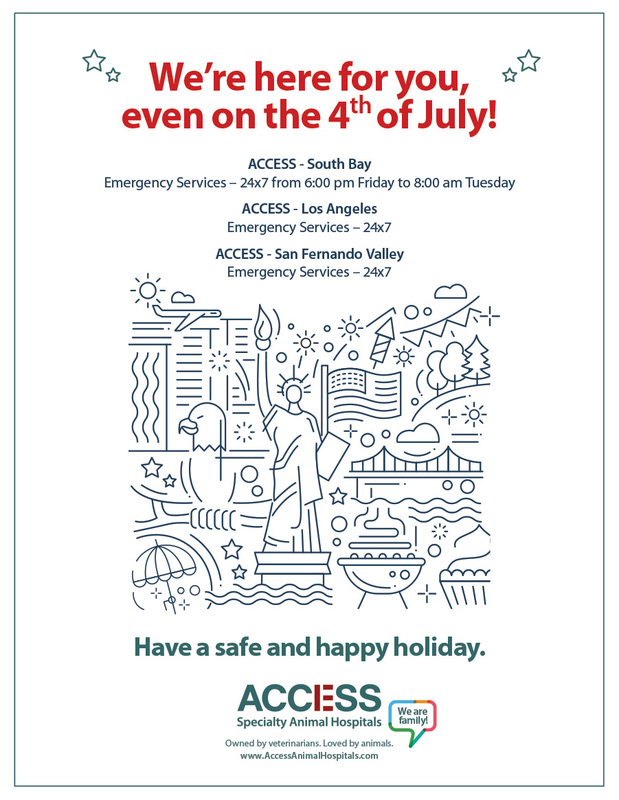 Dr. Petritz is available by appointment Monday through Friday, but is on-call 24×7 for emergencies with the assistance of our emergency department. Preventing stomach upset in your pets this season. The holiday season has just begun and there are scrumptious cookies, delectable cakes, and feasts of savory turkey waiting just around the corner! During the holidays, we find ourselves not only being thankful for our family, pets, and friends, but also in the spirit of giving. It can be so hard to say no to those big puppy dog eyes staring at us by the table! 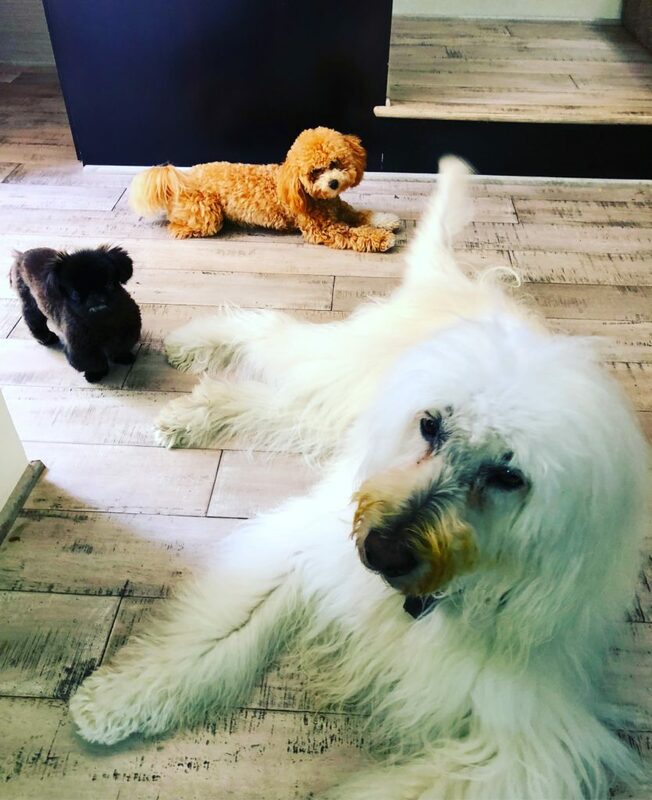 Indeed, this is by far the most common season to notice our four legged friends having gastrointestinal (GI) issues—more commonly known as a stomach ache—from table scraps or new treats they are offered with the best of intentions. When our pets are used to eating one type of food, whether it is canned, grain-free, specialty, or store brand, the body gets used to it and normal bacterial flora grows in the GI tract. This bacteria lives happily in a specific pH that allows balance between health of the intestines and health of the bacteria. It’s actually much more dangerous than you may think to give in and feed Fido even just the smallest piece of juicy seasoned turkey skin! Seasonings, fat, and just simply a change in diet can cause inflammation of the entire GI tract, and sometimes the pancreas, too. Fido’s body will try to get rid of the new substance by vomiting, which is usually followed by loose stool as it passes through the system. It changes the pH in the intestinal tract and can kill off the good bacteria, allowing bad bacteria to grow. If there is more than one bout of vomiting or diarrhea, however, it is time to visit the vet. Although I am gearing up for a busy season of gastroenteritis and pancreatitis cases, I hope that we can work together to minimize the GI distress by saying no to the begging this season. Happy Holidays!